Tamara taking photos from the ruins of the Spanish mill. It’s time to move on from Salinas to Quillacas this afternoon. It is always a bittersweet moment when we transition from one quinoa growing town to the next. Each has its own distinct personality and ways of being. Once you are in its rhythm, it’s hard to leave, sort of like trying to get out of a rip tide at the seaside. Once you are in the vibe of the town, so many opportunities and surprises start opening up. We had to decline invitations to community celebrations next week, invitations to visit new places, invitations to present at local organizations, create more programs, film more events, participate in community ceremony. It is always sad. It makes me want to divide myself into a million pieces so I can be everywhere at once. Our memories of Salinas lay in the humor and kindness of its people. Always a smile and hello from strangers we pass in the street, our growing community of plaza market sellers whom we visit regularly to eat lunch with, interview, or chat about the day’s events. Our caseras (sellers) who provide fresh cucumbers, tomatoes, eggs and goodies for our home kitchen. 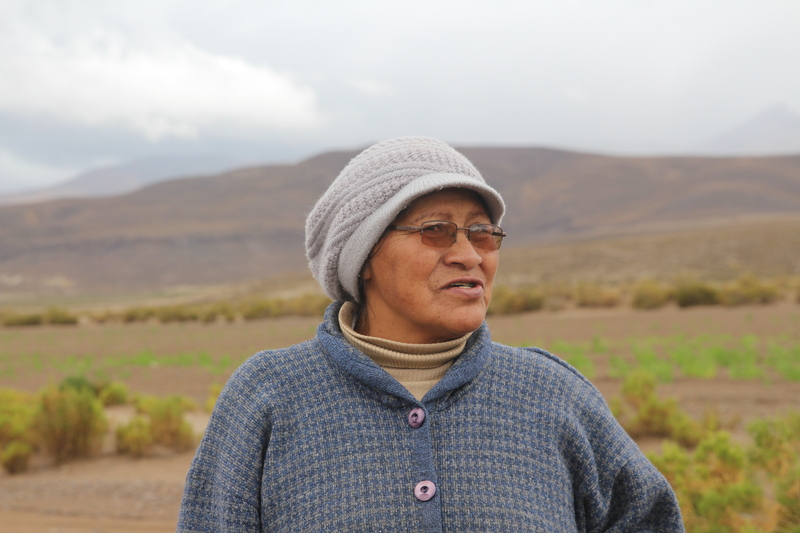 And our host Alex and the Technical University of Oruro, who made their research center available to us – giving us space to explore, write, cook and help out on reforestation projects. Me and my daughter, my research companion. 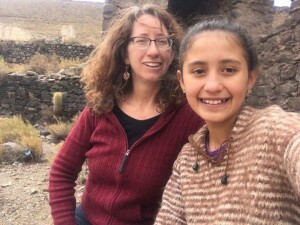 I think of the people we have met and budding friendships: Gladys Mayorga – the regional consejal who exports local quinoa throughout South America; Abad Huayllani – the lawyer from Santa Cruz, who also doubles as a quinoa farmer and now as Mallku in a one-year position as the region’s indigenous leader. 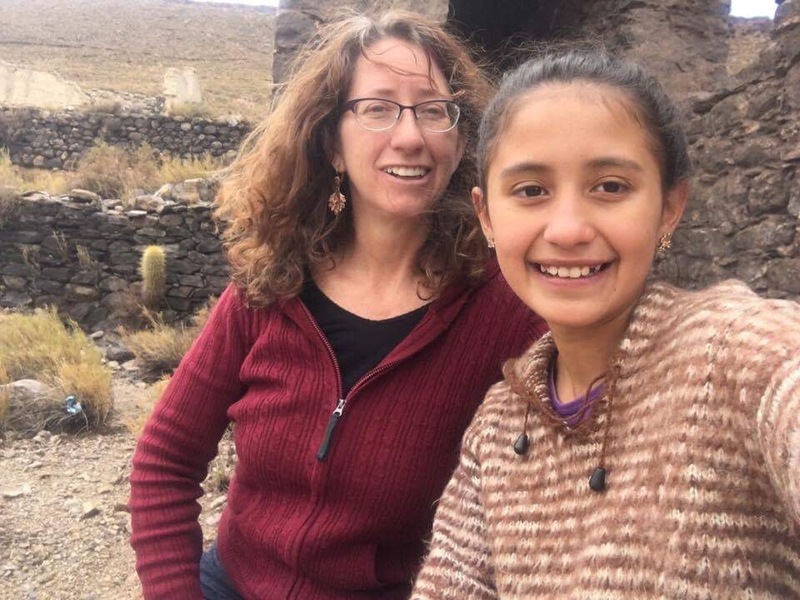 Eloy Ignacio Mamani – a quiet quinoa farmer living in the tiny community of Soloja; Liboria Perez who cooks delicious soups for sale in her wheel barrel food cart – peanut soup, quinoa soup, llama caldo (broth) and more! Plus she toasts and grounds her quinoa into a delicious pito – a powdered, edible form of the grain. And I think of my 13-year-old daughter’s bold act of citizen empowerment. 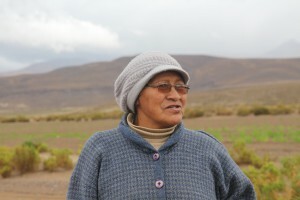 Noting the lack of flowers in the main plaza – while villagers all had lovely flower gardens at their homes – she wrote a letter to the town mayor in and English and Spanish asking him to plant flowers and suggesting he ask people volunteer their own flowers form their gardens if he did not have the funds to pay for flowers himself. Florinda Consales – instrumental in helping to make the Salinas research site a success. Our memories also lie in the amazing beauty and resources of this tiny colonial town located under the watchful snow-capped slopes of the Thunupa volcano at the edge of the Uyuni salt flats (Salinas – means “salty” in Spanish). 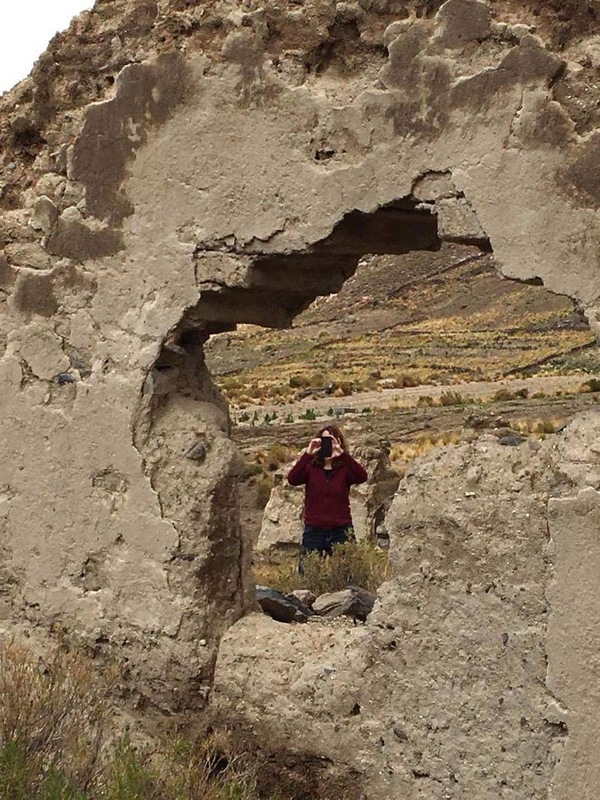 The ruins of the 500 year old Spanish grain mill, the naturally carbonated mineral water springs, the volcanic soils and crunchy lava stones, and the wild emus and vicunas that glide across the vast pampas of tola bushes and tall, stiff, grasses. So, it is with bittersweet thoughts we get ready for the day – a final walk out to the flooded salt flats, a final lunch in the plaza, and the women’s sustainability workshop I will deliver this afternoon with our host, the local hospital. Then it’s on the bus – and off to Quillacas, a looming hillside community, an hour away – the site of a colonial miracle and within view of the supposed location of Atlantis – the lost undersea community of long ago.